CEO David Van Andel said the appointment of Dr. Peter Jones as director of research marks a "turning point" for the VAI. Dr. Jones comes to the institute with a career full of research experience. GRAND RAPIDS (WZZM) -- The Van Andel Institute made what it called an historic announcement Monday. CEO David Van Andel said the appointment of Dr. Peter Jones as director of research marks a "turning point" for the VAI. Dr. Jones comes to the institute with a career full of research experience. 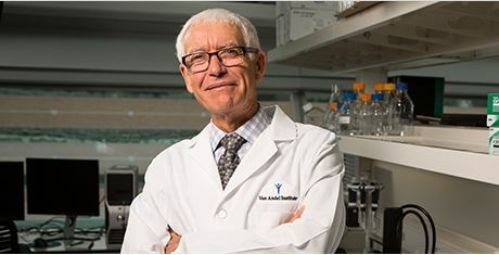 Most recently, he directed the Cancer Center at the University of Southern California. "What we need to do is to be able to make an impact on people's lives, that's why I came to the Van Andel institute this is an amazing place," Dr. Jones said. He is an international leader in the field of epigenetics, which is the study of modifications to DNA that can turn genes on or off. Dr. Jones plans to recruit more people to the Institute and make Grand Rapids the worldwide leader in epigenetics discipline.